The Fine Arts Department has voiced concern over the damage squatters are doing to a valuable forested area near Sukhothai historical park. Anandha Chuchoti, director of the department’s 6th Regional Office, said the squatters had encroached along an ancient route in the outer part of the historical park and stepped up their destruction of the forest in recent years, resulting in the loss of hundreds of rai. “The villagers have cleared the forest, turning it into cash crop plantations, in particular sugar cane fields,” he said. 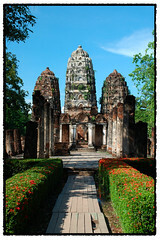 The encroached area surrounded ancient ruins such as Wat Tapan Hin, which once served as a forest monastery.